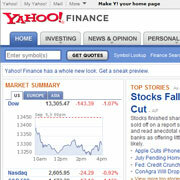 What's New at Yahoo! Finance. Sign up to get free alerts. 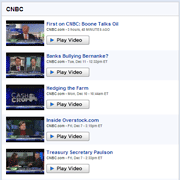 Stay on top with breaking business news and timely market analysis videos from CNBC. Yahoo! Finance features fourteen video reports each weekday, along with articles from CNBC.com, delivering financial essentials quickly and accurately. Yahoo! 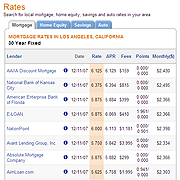 Finance now provides rates for Mortgages, Home Equity Loans, Auto Loans and Savings Accounts. You can view average rates across the country for today and last week, as well as search for local rates for popular products in these categories. With Smart Lookup, we'll help you find quotes faster. You no longer need to remember symbols when using the quote box. Simply type in a company name or symbol and we'll display possible matches. We have made it easier for you to find the information that is most important to you. We have also added some new features to help you keep on top of what's happening on Wall Street and all around the world. 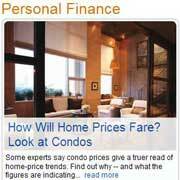 Check out Personal Finance now! 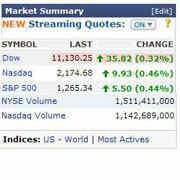 Stay on top of market events with timely market-update videos by Fox News. Yahoo! Finance features nine original two-minute market reports each weekday, delivering financial essentials quickly and accurately. No need to keep hitting your refresh button anymore. 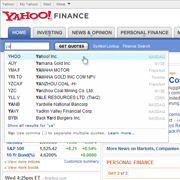 Live streaming quotes are available across Yahoo! Finance. * Streaming quotes are subject to standard delays due to market regulations: 15 minutes for Nasdaq, 20 minutes for NYSE and Amex. We supply the code. You cut and paste it into your html. What could be easier? We've been keeping our eyes on the freshest thinking and newest insights in the field of Finance. Jim Citrin writes "Leadership By Example" every other Wednesday, spotlighting what it takes for CEOs and celebs to succeed in this dynamic world. Ram Charan writes "What Every Company Should Know" every other Thursday. He is an advisor to top CEOs and shares practical real world advice for cutting through complexity to achieve profitable growth. Get insights from experts in the financial field. All information provided "as is" for informational purposes only, not intended for trading purposes or advice. Neither Yahoo! nor any of independent providers is liable for any informational errors, incompleteness, or delays, or for any actions taken in reliance on information contained herein. By accessing the Yahoo! site, you agree not to redistribute the information found therein.